“VADER: Don’t be too proud of this technological terror you’ve constructed. The ability to destroy a planet is insignificant next to the power of the Force. Judging from Admiral Motti’s comments, are we led to believe that the Jedi Order was a religious one? Considering that its members devoted a great deal of time studying and adhering to the mystical energies of the Force, perhaps it would not be wrong to say yes. And if the Jedi was a religious order, why did they allow themselves to serve a political body like the Galactic Republic? As I had mentioned in the previous essay, Obi-Wan Kenobi had informed Luke Skywalker in “A NEW HOPE” that the Jedi had served as guardians of peace and justice for the Galactic Republic. In other words, the Jedi acted as diplomats, agents of political intrigue, investigators and even warriors for the Galactic Senate. And I cannot help but wonder if the Jedi Council had made a mistake in forming such a connection. 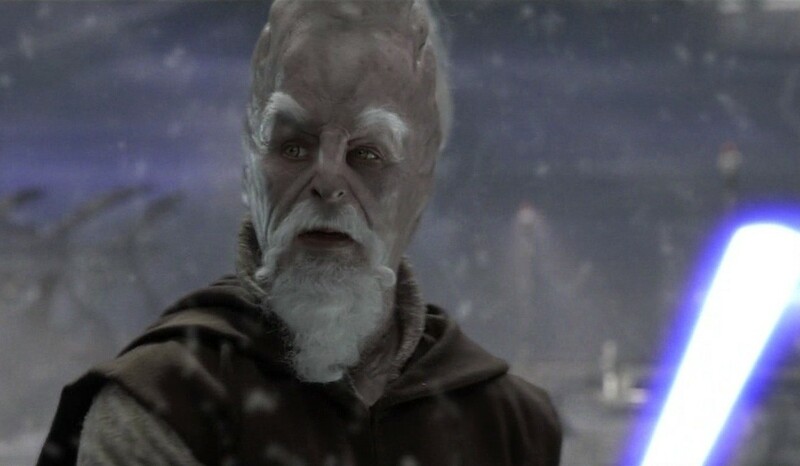 At the time of “THE PHANTOM MENACE”, the Cerea-born Jedi Master, Ki-Adi Mundi was a member of the Jedi Order Council. And he was among those who rejected Anakin Skywalker as an initiate for the Order. Apparently, he agreed with his colleagues that Anakin, at the age of nine, was too old to be initiated into the Order. In “ATTACK OF THE CLONES”, he was among the Jedi who accompanied Yoda and the Clone troopers to rescue their Jedi colleagues and attack the Separatists on Geonosis – an action that began the three-year Clone Wars. But it was in “REVENGE OF THE SITH” where Master Mundi made a questionable suggestion. It was he who had suggested that the Jedi Council assume control of the Galactic Senate if Palpatine refuses to step down at the end of war. Not much came from this suggestion, despite Masters Yoda and Mace Windu supporting his suggestion. But it was a sign that the Jedi were willing to commit questionable acts in order to preserve the Republic and more importantly, preserve the Jedi’s status and existence. 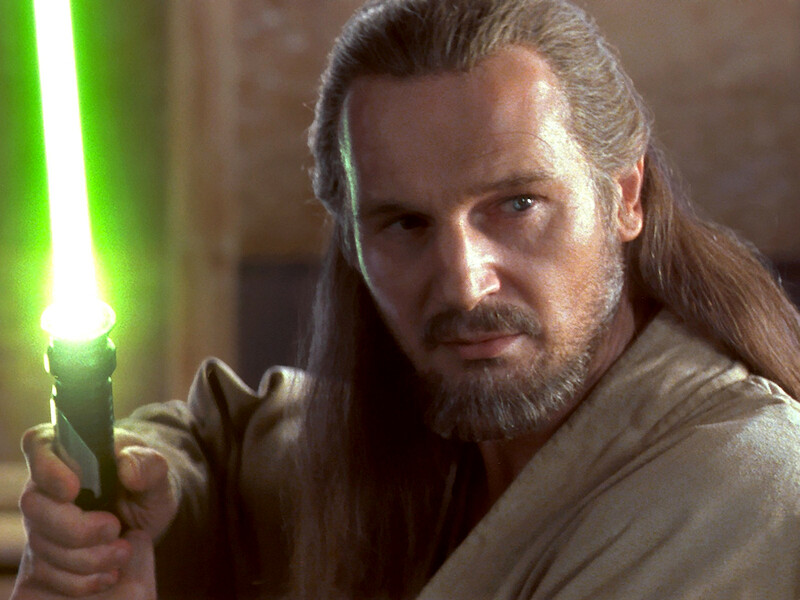 When Jedi Master Qui-Gon Jinn first came to my mind, I found it difficult to spot any flaws in his personality, especially since he happens to be my favorite character in the entire saga. This is ironic – at least to me – considering that many other STAR WARS fans have heavily criticized him. However, despite my feelings for Master Jinn, I have become aware of a few flaws in his psyche. But my criticism of the Jedi Master does not match those expressed by other fans. Many STAR WARS fans have criticized Master Jinn for ignoring Master Yoda’s warnings about initiating Anakin Skywalker into the Jedi Order. They have also criticized him for defying the Jedi Council on a regular basis. In fact, they see his unwillingness to abide by the rules and act like the good little Jedi Master as a sign of his potential to succumb to his inner darkness. I do not agree with this legion of STAR WARS fans. I saw nothing wrong with Master Jinn’s defiance of the Jedi Council. I believe that it is healthy to question and defy authority when you need to. Blind obedience strikes me as not a good path to character development. And Master Jinn had been right about Anakin. The boy did turn out to be the Chosen One. Yoda, Windu, the rest of the Jedi Council and Obi-Wan were so focused upon their fears of the future that they failed to heed Qui-Gon’s warning that the future is not set in stone. However, this did not make Master Jinn the only perfect character in the STAR WARS saga. Trust me, he had his flaws. While watching “THE PHANTOM MENACE”, I was struck by Master Jinn’s tendency toward stubbornness. It is one thing to know one’s mind. It is another to do so without considering the advice or words of others. I suspect that Master Jinn may have been one of those types who are so intent upon adhering to his own beliefs that he would blindly refuse to consider those of others. Although Qui-Gon had been right about Anakin, I cannot help but wonder if there had been any past advice he had ignored due to his own stubbornness. Judging from how Master Jinn managed to procure Anakin’s freedom from Tatooine shop owner, Watto, one could also accuse him of being a manipulator. Naboo’s young queen, Padme Amidala not only seemed aware of Qui-Gon’s manipulative nature, she had also commented upon it with an air of disapproval. Like his fellow Jedi Master, Ki-Adi Mundi, Mace Windu was a member of the Jedi Council in “THE PHANTOM MENACE”. He was the one who tested Anakin Skywalker’s connection to the Force. And although he seemed impressed by Anakin’s abilities, he also rejected the nine year-old boy’s initiation into the Order. Along with Yoda, he questioned Anakin’s attachments to Shmi Skywalker, completely ignoring the possibility that he and his fellow Jedi were just as attached to the Jedi Order. Nor did he bother to consider Jedi Master Qui-Gon Jinn’s suggestion that Anakin might be the Chosen One mentioned in the Journal of the Whills prophecy. When Master Yoda suggested that they refrain from informing the Senate of the Jedi’s diminished connection to the Force in“ATTACK OF THE CLONES”, Master Windu supported this decision – another example of the Jedi’s willingness to do anything to maintain the Order’s status quo. Master Windu’s arrogance came into play during the Jedi’s attempt to rescue Jedi Knight Obi-Wan Kenobi from Count Dooku and the Separatists forces on Geonosis. He seemed so certain that the Jedi would prevail that he had failed to consider the possibility that they would end up outnumbered. However, Master Windu’s worst mistakes occurred in “REVENGE OF THE SITH”. When Anakin had first been introduced to the Jedi Council in “THE PHANTOM MENACE”, he had been among those who did not believe that the former slave was the ”Chosen One” who would bring balance to the Force. His opinion had changed to Anakin’s favor in “ATTACK OF THE CLONES”. 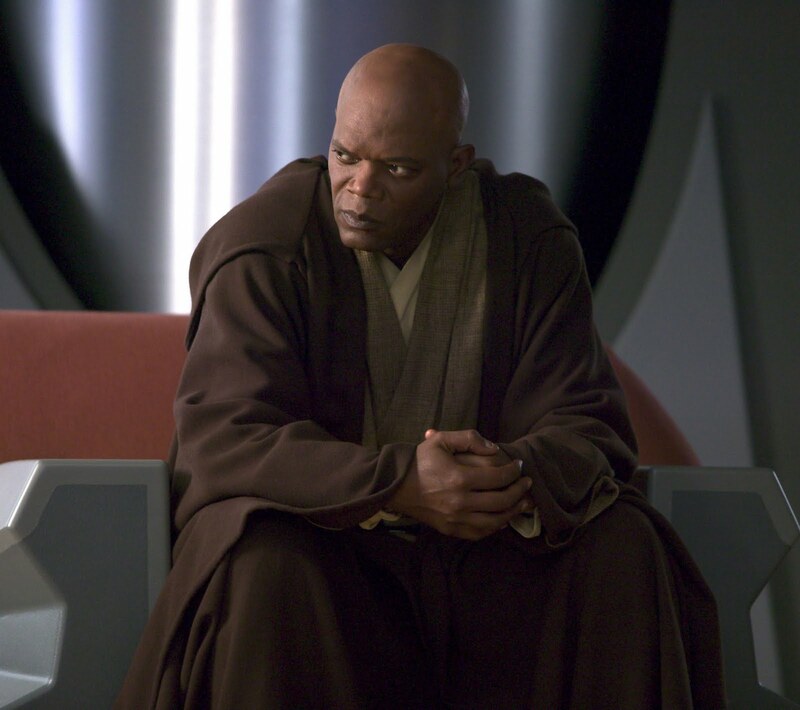 Yet, after the Jedi Council had learned there was a Sith Lord among Chancellor Palpatine’s circle, Windu’s belief in Anakin becoming the “Chosen One” took a nose dive, due to the latter’s friendship with the chancellor – and for no other reason. He also supported Ki-Adi Mundi’s suggestion that the Jedi Council assume control of the Galactic Senate if Palpatine ever failed to step down as chancellor. But in the end, Windu made his biggest mistake when he set out to arrest Palpatine after learning from Anakin that he was a Sith Lord. Many fans have complained that Master Windu should have done the following: 1) wait for Master Yoda’s return from Kashyyyk; or 2) confront Palpatine with Anakin by his side. One, I never saw the need for Windu to wait for Yoda. I believe that he was certainly capable of confronting Palpatine on his own. Which he did not do. Jedi Masters Kit Fisto, Agen Kolar, and Saesee Tiin had accompanied him to Palpatine’s office. Granted, they had failed to give him much support, but I do not see how Windu could have foreseen this. As for his decision to leave Anakin behind . . . I saw nothing wrong with it, either. Windu had correctly sensed the fear that threatened to cloud Anakin’s judgment. 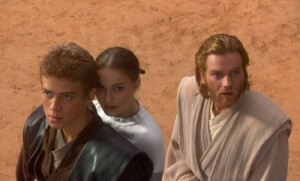 If I had been Windu, I would have also left Anakin behind. But the Jedi Master did make two serious mistakes – from my point of view. One, he had confronted Palpatine without informing the Senate or with any evidence that the Chancellor was a Sith Lord. He had arrogantly assumed that as a Jedi Master, he had the right to confront Palpatine without considering the latter’s role as the political leader of the galaxy’s ruling body. And two, ignoring his earlier resolve to simply arrest Palpatine, Windu decided to kill the latter. It was not a matter of whether he was capable of committing this deed. He failed to consider that his determination to destroy what he perceived as evil, had led him to a dark place and his own death. Because he had been portrayed as the embodiment of Jedi wisdom in the Original Trilogy, many STAR WARSfans – especially the long time fans – have been inclined to dismiss or make excuses for Master Yoda’s mistakes and flaws in the Prequel Trilogy. And Yoda made just as many as Mace Windu. Yoda was one of the senior members of the Jedi Council who rejected Anakin’s bid to join the Order in “THE PHANTOM MENACE”. Like the other members of the Order, Yoda viewed Anakin as a threat to their way of life, claiming that his future was clouded. Many fans had viewed this as confirmation that Yoda probably sensed Anakin’s future as a Sith Lord, when the latter was first introduced to the Council. Personally, I rather doubt it. I suspect that Yoda and the other Council members viewed the nine year-old Anakin as someone with an established outside connection or someone with a connection that might clash with their influence. Which would explain why they viewed Anakin as “a loose cannon or an unknown factor”. If there is one thing that individuals fear more than anything it is an unknown future. I find it rather odd that the Jedi had never sensed Count Dooku as a future threat. Especially Yoda, who had been Dooku’s personal Jedi tutor. When the Council finally agreed to initiate Anakin into the Order, Yoda was the only one who disagreed with this decision. He also disagreed with Obi-Wan Kenobi’s decision to choose Anakin as his padawan. I would not have had a problem with this if Yoda had agreed to give Anakin some initial training before Obi-Wan could assume the role as the nine year-old’s personal Jedi master. But he did not. The movie never confirmed that Yoda had foreseen Anakin becoming a Sith Lord. So, why did he seem determined to have nothing to do with Anakin? How was it that he viewed Anakin as a future threat, yet failed to do the same in regard to his former padawan, Count Dooku? Or sense that Chancellor Palpatine was a Sith Lord? 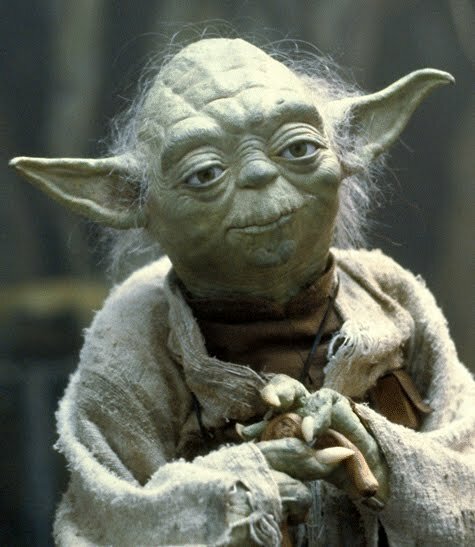 Had Yoda’s own fears of Anakin’s unusual initiation into the Order and high midichlorian count intimidate him? Did he view Anakin as some symbol of an unknown future? Had this fear of Anakin led to the young initiate being one of the very few who had never received any training – whether as a youngling or a padawan – from Yoda? I cannot help but wonder. Moving on to “ATTACK OF THE CLONES”, I tried to recall any mistake or bad judgment call that Yoda may have committed. At first, I believed there was nothing I could criticize him for . . . until I remembered the conversation between him and Windu regarding the Jedi’s connection to the Force. After the two Jedi Masters had received a message from Obi-Wan Kenobi about the Kamino drone factory, Windu suggested they inform the Galactic Senate of their diminishing connection to the Force. Yoda nay-sayed the idea, claiming their list of adversaries would grow if they had announced this disturbing news. One could say that Yoda made a sensible decision. Or did he? Why did Yoda insist upon this suppression of the truth? Was it perhaps he feared that if the Senate knew the truth about the Jedi’s weakening connection to the Force, the political body would find a reason to get rid of the Order? Or end the Jedi’s role as the galaxy’s guardians of peace? In other words, is it possible that Yoda had feared the decline of the Jedi’s role as a major influence in the galaxy? If so, his decision struck me as a sign of the Jedi’s willingness to do anything to perpetrate the status quo and survival of their Order. One of the more ironic moments in “ATTACK OF THE CLONES” had occurred during the Battle of Geonosis. It was Yoda who led the clone troopers into an attack upon the Separatist forces. It was he who as leader of the Republic forces, acted as the aggressor in the start of the Clone Wars. One could defend Yoda’s actions, claiming that he did so on the behalf of the Chancellor and the Galactic Senate. And that person would be right. But this would have never come about if the Jedi Order had not agreed to serve as the Senate’s political, intelligence, diplomatic and military force. “REVENGE OF THE SITH”, in my opinion, truly exposed some of Yoda’s personal fallacies. Like Windu and the rest of the Jedi Council, they had made the assumption that Anakin’s friendship with Chancellor Palpatine automatically made him untrustworthy. Then again, Yoda had never really warmed up to Anakin. His unwillingness to bend to Anakin would prove to be catastrophic. And like Windu, Yoda had agreed to the ludicrous plan to use Anakin to spy upon the Chancellor, not realizing that it would alienate the young Jedi Knight even further against the Jedi Order. But Yoda made even bigger mistakes. Again, like Mace Windu, he agreed to Ki-Adi Mundi’s suggestion that the Jedi commit a coup d’état against Chancellor Palpatine by removing him from office if he fails to give up his political powers by the end of the Clone Wars. Although Yoda stated that such an idea would be dangerous, he still seemed willing to act upon it. This was another sign of the Jedi’s willingness to resort to questionable acts in order to maintain their Order’s status quo and survival. However, Yoda made his biggest mistake when he decided to kill Palpatine, following the Order’s destruction via the Chancellor’s Order 66. Unlike Windu, Yoda had no interest in arresting Palpatine. And he certainly made no attempt to reveal what he knew about the Chancellor. Blinded by his anger over the Jedi Order’s destruction, Yoda simply tried to kill Palpatine, believing it would be a simple solution to the Jedi’s precarious situation. It almost seemed as if Yoda did not want to acknowledge that the old Jedi Order’s time was over. Or that nothing lasts forever. One could easily accuse the Jedi Master of arrogance and of allowing his attachment to the Jedi Order to blind him from its fate. Even if he had managed to kill Palpatine, the Galactic Senate could have easily accuse him of murder . . . and they would be right to do so. Yoda’s act of aggression against Palpatine – whether he had succeeded or not – may have damaged the Jedi’s reputation within the Republic-turned-Empire even further. When he failed in his attempt to kill Palpatine and found himself fleeing from the Senate building, I suspect that Yoda finally realized the extent of his many mistakes. Following the events of “REVENGE OF THE SITH”, Yoda spent the next 23 years living on the remote planet of Dagobah. 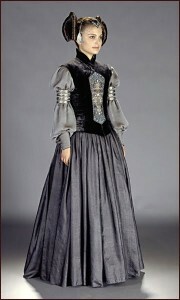 Then he met Luke Skywalker, the son of former Jedi Knight Anakin Skywalker and Naboo Senator Padme Amidala. Luke had been sent by Obi-Wan Kenobi’s ghost to learn the ways of the Force from Yoda. One would think that after years of contemplating his mistakes and learning more aspects of the Force by the ghost of Jedi Master Qui-Gon Jinn, Yoda could do no wrong. The events of “THE EMPIRE STRIKES BACK” proved otherwise. Like Obi-Wan, Yoda failed to tell Luke that his father – Anakin Skywalker – and the Emperor’s apprentice – Darth Vader – were one and the same. Both Yoda and Obi-Wan wanted Luke familiar with the ways of the Force in order to confront both the Emperor and Vader. Perhaps they feared if Luke knew the truth about his paternity, he would not be so eager confront the two Sith Lords – especially Vader. I suppose they believed they were only doing good. Yet, both Jedi Masters nearly tripped over their lies, when Luke learned the truth from Vader on Bespin. And what would have happened if Vader had never told Luke his real identity? Either the Sith Lord would have eventually killed Luke . . . or Luke would have killed Vader without learning that he had just killed his father. And could you image Luke’s reaction upon finally learning the truth about Vader? I suspect that his reaction to learning that Yoda and Obi-Wan had lied to him in “RETURN OF THE JEDI” would have been benign in comparison. Before I end this article, I want to say one last thing about Yoda. Many have regarded some of his advice as words of wisdom and pointed out that if certain characters had heeded them, the Republic would have been spared a great deal of grief. In “THE PHANTOM MENACE”, it was Yoda who pointed out that Anakin’s future was clouded by fear and attachment to the memory of his mother, Shmi Skywalker. And Anakin’s inability to let go of his attachments eventually led to his downfall. Yoda pointed out that the majority of Jedi Knights and Masters had become arrogant over the years in “ATTACK OF THE CLONES”. Once again, he was right. And in “REVENGE OF THE SITH”, he gave a lecture to Anakin about how the fear of loss could lead an individual to succumb to his/her inner darkness. Yet, Yoda’s reaction to the loss of Mace Windu and other members of the Jedi Order was to seek out Palpatine and kill him without considering the consequences of such an act. Like many others, Yoda was very good at dispensing advice. Unfortunately, he did not seem that adept at heeding his own advice. Before one comes to the conclusion that I have a dislike of the Jedi Order. I do not. What I was trying to prove was that despite their reputation among STAR WARS fans for being morally above board, they had their flaws. The Jedi Masters featured in the saga were not above allowing their emotions and ego to drive them into making some serious mistakes. They were not invincible . . . and should never be viewed as such. Also, my criticisms of the Jedi Order are not a reflection of my opinion of George Lucas as a storyteller. 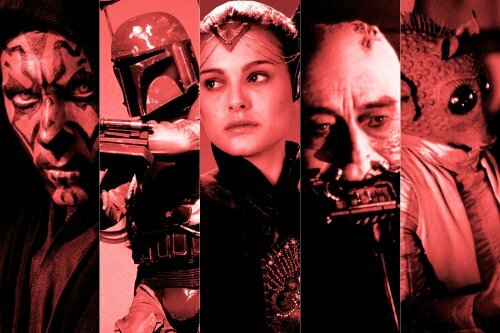 I have come across many STAR WARS fans who have either criticized Lucas for portraying the Jedi as flawed characters, or made excuses for their actions. I can do neither. One of the reasons why I have such a high regard for Lucas’ saga is that he was willing to show that characters such as Yoda, Mace Windu and the other Jedi are capable of great flaws – regardless of whether they would are deemed “good or evil”. It is this ambiguity that makes “STAR WARS” a personal favorite of mine. In the following article, I will discuss one last Jedi character – namely Jedi Master Obi-Wan Kenobi. And I have a lot to say about him. 2. “Episode III – Revenge of the Sith” (2005) – In the last Prequel Trilogy movie, Jedi Knight Anakin Skywalker concludes his journey to becoming a Sith Lord, following three years of fighting the Clone Wars and puts his friendship with Jedi Master Obi Wan Kenobi and his marriage at risk. Very intense. 3. “Episode I – The Phantom Menace” (1999) – In the first Prequel Trilogy, Jedi Master Qui-Gon Jinn and his apprentice, Obi-Wan Kenobi investigate the Trade Federation’s takeover of the planet of Naboo and meet nine year-old Anakin Skywalker for the first time. 4. “Episode IV – A New Hope” (1977) – This is the first movie in the Original Trilogy and the first to be released in the theaters. It tells the story of farmboy Luke Skywalker, who leaves his home planet and teams up with other rebels, while trying to save Princess Leia from the evil clutches of Darth Vader. 5. “Episode VI – Return of the Jedi” (1983) – The last Original Trilogy movie featured the rescue of Han Solo from Jabba the Hutt and the Rebels’ attempt to destroy the Second Death Star. Meanwhile, Luke Skywalker tries to get his father to reject his role as the Emperor’s apprentice.